A battery isn’t just a battery — it has its own nature and characteristics. That’s why managing your battery’s life depends on the type of battery it is. For instance, the two more popular kinds rechargeable batteries these days are Lithium-Ion and Lithium-Polymer. The older Nickel-Cadmium are obsolete. One thing is constant: a battery goes through a certain number of discharge cycles before you can give up on it. You can remove a battery to “prolong” its life Should I Remove My Laptop Battery To Increase its Life? Should I Remove My Laptop Battery To Increase its Life? Does running your laptop on AC power damage the battery? Should you remove the battery to increase its lifetime? You've probably wondered about this. Find out the answer now! Read More when you aren’t using a laptop for a long time. But for everyday use, it’s not a practical idea. The better option is to become a master of battery management. Here are two resources that will help you tackle your battery woes on Apple devices and Windows machines. Windows 10 has a new Battery Saver feature that automatically manages the power when it falls below 20% (default). Microsoft Support has a detailed page that guides you through the feature with more tips. The Battery Saver squeezes out more time by limiting background activities and reducing the brightness of the screen among other things. 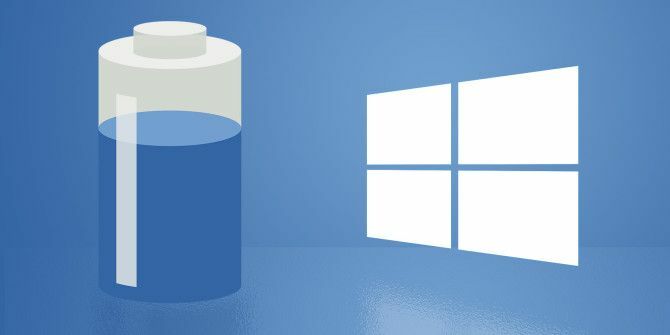 You can control these settings and maximize the use of your computer’s battery How to Optimize Windows 10 for Battery Life How to Optimize Windows 10 for Battery Life Battery life is a pretty important factor for mobile devices. While Windows 10 does offer new features to manage power settings, the defaults are not necessarily contributing to optimal battery life. Time to change that. Read More . Remember, Windows 10 has many settings to save the machine’s battery life. Work through all of them and tell us what works for you in the comments. Apple has a more comprehensive support page that covers all the battery facts for its range of devices. For instance, pay attention to the temperature and moisture of the room where you work from. It’s one of the more obvious steps you can miss when you want to prolong the life of your Apple device. Of course, it may not be that easy to control in the real world. But you can stay aware of the battery’s status with the help of a little icon in the menu bar on top. Check the Battery Status with a click on the battery icon. Here, you can see basic information about the battery’s, and a list of apps that are chomping on a large portion of the power supply. You will usually find Chrome here if you have multiple tabs open. Go to the Activity Monitor for a more specific idea of the apps eating a power lunch. You can access it from Applications > Utilities > double-click on Activity Monitor. Now, click the CPU, Memory, Energy, Disk and Network tabs to see which programs are consuming the most resources in the respective areas. Quit the greedy ones. Little things like Spotlight indexing may make your computer run hot and affect the battery. So, work through all the battery saving tips for your MacBook How to Improve Your MacBook’s Battery Life How to Improve Your MacBook’s Battery Life While the current MacBooks are quite powerful, they have the same battery life as their predecessors. So what can you do? Quite a bit, it turns out. Read More and manage them before problems crop up. Companies are designing better ways to prolong battery use. It is the Holy Grail of today’s electronics. The support pages supplied by Microsoft and Apple are good reference points to grab the knowledge before you unbox your device. Has your battery died before its due date? Do recommend a few practical battery saving tips that work for you. Steemit.com is another website where you are payed for what you post.